With construction processes being streamlined and pre-fabricated building elements having to make provision for services to pass through, project managers are beginning to realise the cost benefit of getting passive fire protection right the first time. Traditionally, the trades were able to ‘tag-out’ fire stopping from their scope of work. This evolved to each trade trying their hand at doing their own fire stopping or sub-contracting this out to experienced passive fire installers at considerable cost. This resulted in messy PS3 compilations, penetration number registers, and made construction monitoring a nightmare. Compliance was the next hurdle and the cost of re-works of non-compliant installations by individual trades, and their sub-contractors, resulted in huge budget blow-outs. Add the eagle-eyed quantity surveyors to the mix, charged with keeping a lid on labour costs and re-works — and this results in a situation where everyone blames the other and no one takes responsibility. This created the opportunity for the emergence of a flood of new (inexperienced) specialist passive fire installers to enter the market. Being versed with the compliance requirements of the NZBC relating to fire stop requirements (see appendix below), passive fire installers went about attending to the installation of compliant penetration seals for each individual service. These seals are of a permanent nature and when additional services are required to penetrate the fire wall, a new seal would need to be installed. A new invoice followed. With the introduction of new technology in fire mastics, the high pressure expanding mastic (HPE) has paved the way for a multiple service, single point of entry, transit box to be developed. It should be borne in mind that when the building element to be penetrated by a service is prepared in the prescribed manner, so as to facilitate the installation of a compliant penetration seal, no re-works should be necessary. There are penetration seals tested to AS1530.4 and compliant with the NZBC that when installed in accordance with the manufacturers specifications are cost effective on a supply and install basis. However, the passive fire installation contractor/specialist is often not consulted in this process and as a consequence the preparation of the building element (and the timing of this activity) leads to un-budgeted costs. An elementary feasibility exercise comparing the supply and install cost of a list of typical services for an individual apartment, using traditional individual fire stopping methodology versus the cost of supply and install of a Boss FyreBox (excluding the cost of concrete drilling through slab walls) was recently undertaken at the request of a quantity surveyor working on an apartment development project. At the end of the exercise, it was discovered that the direct cost of supply and install, was substantially lower than the traditional methods of supply and installation of separate service penetrations. When the indirect cost of possible re-works (as a percentage of the scope of work) was factored in, the true potential cost benefit became apparent. When the exercise was modified to include the cost of concrete drilling through erected concrete structures for the individual traditional service penetrations, the picture became even more apparent. When Potters extrapolated these savings over the number of apartments (fire cells) in the development in question, the figure was in the hundreds of thousands of dollars on the bottom line of the project. Construction companies are considering installing the Boss FyreBox themselves. Saving labour cost (time of installation), reducing the human error factor (cost of re-works), decreasing the cost of passive fire construction monitoring and having a compliant penetration seal specified into the QA process, all contribute to delivering the project on time and within budget. 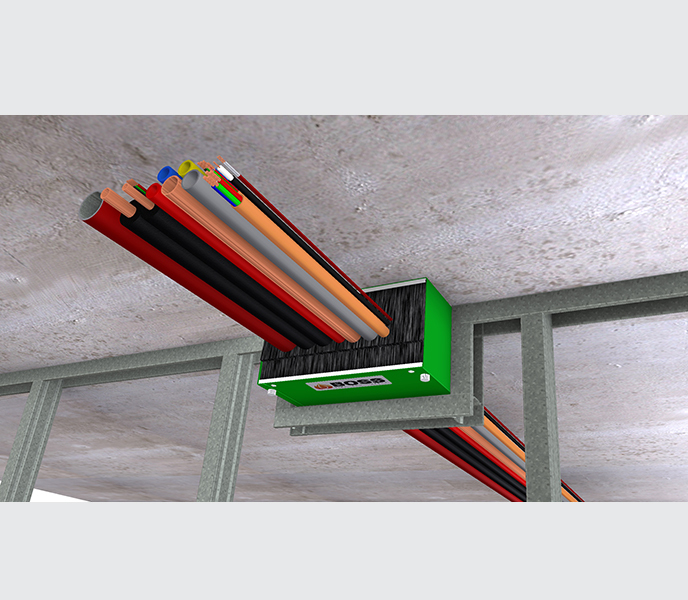 The BOSS FyreBox is a game changer that has the construction industry challenging traditional installation methodology, in pursuit of the substantial cost reductions in the supply and install of tested (AS1530.4 – 2014) NZBC compliant passive fire penetration systems.